A zombified tale as old as time made trendy for today's junior Walking Dead audiences, the Valentine's week debut of Disney's Zombies marked a gutsy programming decision for a network well-known for its success updating the House of Mouse's popular 1960s bright, beachy, musical romcom formula for youthful twenty-first century audiences. Based upon Zombies and Cheerleaders, an unaired 2012 Disney Channel pilot from screenwriters David Light and Joseph Raso, the 2018 feature length iteration brought back the two series creators, granting them the chance to infuse their clever concept with an even more contemporary twist. Taking the idea of a wrong side of the tracks romance to bold new heights, Disney's Zombies opens with a vibrant animated prologue which brings us up to speed. Fifty years ago a power company accident with lime soda whipped up a contaminated haze potent enough to turn some of the residents of the formerly idyllic Seabrook into zombies. Fearing for their lives, those unaffected by the contaminant decided to build a Cold War, Berlin style wall to keep the two groups apart. 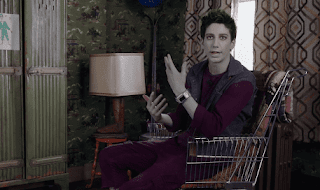 Fortunately, with their hunger for brains soothed by electro-pulses delivered throughout the day from a smartwatch dubbed a Z-band, the zombie students of Zombietown (including our charming main character Zed, played by Milo Manheim) are excited to follow through on a recent city council decision to allow zombies to attend school alongside the humans of Seabrook. When his dream to play for Seabrook High School's football team is dashed by a fearful principal who vows to keep the students separated by segregating the zombies to a dingy basement, Zed decides to break free – thinking if people just met him (as well as his friends) – they would surely see there's little difference between them after all. 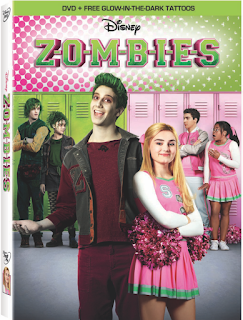 Although his optimism is temporarily crushed by a school-wide panic when a student spots Zed and sets off the zombie version of a fire alarm, he gets a second chance at a first impression when he meets a beautiful human in the form of aspiring cheerleader and fellow freshman, Addison (Meg Donnelly). Taking shelter in the dark, the two engage in friendly banter before they even catch sight of one another (and despite her catching his eye earlier in the film). Yet while Addison's initial defensive response was to punch the tall, cute, green haired zombie on sight as soon as the lights came on, once she comes to her senses, she's just as fast with an apology, realizing that perhaps zombies aren't the horrible people her parents, cousin, and others believe them to be. Particularly empathetic due to a genetic challenge of her own (which was revealed in an effective Ferris Bueller style introduction that broke the fourth wall in order to endear the characters to the viewer while also make us realize how right they are for one another), although all Addison wants is to be normal, she understands more than most how unfair it is to judge others just for being different. Though it's not your average tween spin on Beauty and the Beast, you don't have to be a Z-band scientist to see where Disney's Zombies is going. And while it's safe to say that younger audiences are sure to enjoy the TV movie, some of the swing-for-the-fences performances and shout-tastic line delivery might drive away those old enough for iZombie or Disney’s big sister channel, Free Form. Helmed by longtime Disney Channel veteran Paul Hoen (director of past original movie hits including The Mistle-Tones, Camp Rock 2, and Cheetah Girls: One World) and choreographed by Christopher Scott and Steven Vincent, it’s well-worth putting up with a few cartoonish moments to relish in some of the work's mind-bogglingly impressive song-and-dance sequences. With echoes of everything from West Side Story to Bring It On and Michael Jackson’s Thriller to the Step Up series all blended together, it’s far more daring in its musical moments than it should've been from a storytelling perspective – missing ample opportunities for mild scares and stronger character development in order to push its topical themes even further. And although it touches on present day allegory – namely the idea of a wall to keep out a population the “perfectly planned" community of Seabrook finds undesirable – and boldly begins to weave some real world applications into its clever plotline, unfortunately the zombiefied premise becomes increasingly Disneyfied as the movie continues. That isn't to diminish what Light and Raso did, however, as you do have to give them credit for even referencing these ideas at all in what most would consider just a light entertainment. Given its impressive production design, which teaches film literacy by providing both zombies and human sets, costumes, etc with a specific and strict color palette right from the start before eventually letting the shades run together, it's an outstanding example of true creativity and proof why you can't simply write off these network titles as generic kiddie fare. 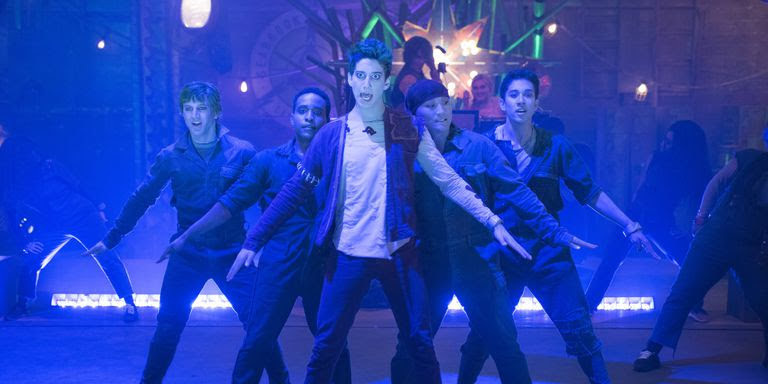 And in addition to Disney's trademark motion picture level dance sequences, Disney's Zombies boasts a few surprisingly effective songs that surely helped attract nearly three million viewers in its February 16 debut. Filling the DVD with audition footage, bloopers, deleted scenes, and a few fun zombified extras including a sheet of glow-in-the-dark tattoos, while this musical geek was hoping for more behind-the-scenes extras relating to the film’s audacious themes and choreography, it’ll definitely delight the young zombie fans in your life.